James Millton (above) is well known as one of the leading ‘new world’ proponents of biodynamics. This is the agricultural system that’s effectively a supercharged version of organics, with some extra stuff thrown in. [More on that later.] When I was planning my trip to New Zealand, he was always high up on my list of who to visit. I’m fascinated by biodynamic wine growers, not necessarily because I agree with all the theory behind what they do, but because they just seem to make more interesting wines. Millton is in the Gisborne region, which is part of New Zealand’s North Island. To reach it, I flew into Napier (Hawkes Bay) and then drove a hire car for 2.5 hours around some rather bendy roads. I was pressed for time, so I made a quick calculation: if you take the bends at 10-15 km/h above the speed advised by the road signs, you’ll be OK.
Gisborne is a slightly anonymous region. It’s quite damp, and not known as a fine wine zone – instead, most of the vineyards here are geared up for making large volumes for the big boys. A lot of sparkling wine material comes from here. This is why it’s especially remarkable that Millton makes such good wines, using biodynamics, in a place where you’d expect the disease pressure to be high, and one that’s not known for top wines. ‘We take lots of risks by not using herbicide and fungicide’, says James Millton. So I turned up, and straight away there was a pair of wines to try. The wine was called Les Trois Enfants, a blend of Gewürztraminer, Pinot Gris and Riesling. The first bottle was screwcapped; the second sealed with a cork. Were they different? Yes. ‘The wine we corked tastes like the wine we bottled’, concluded James. Then it was time for some crazy stuff. James warned me that I might wish to leave at this stage. He produced two wines – again, the same wine, but one bottle of which had been standing overnight on a mat made up of small pyramid shapes. I thought there might have been a difference between the wines, but I couldn’t be sure, and there’s certainly no theoretical reason why the wines should be different. The wine was Millton’s top Pinot Noir, and it was gorgeous. Some background on The Millton Vineyards. 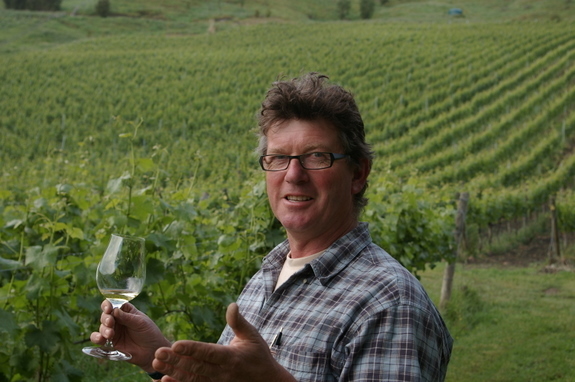 ‘I’ve been doing biodynamics now for 23 years’, says James, who started the Millton Vineyard in 1984, when he was 28. 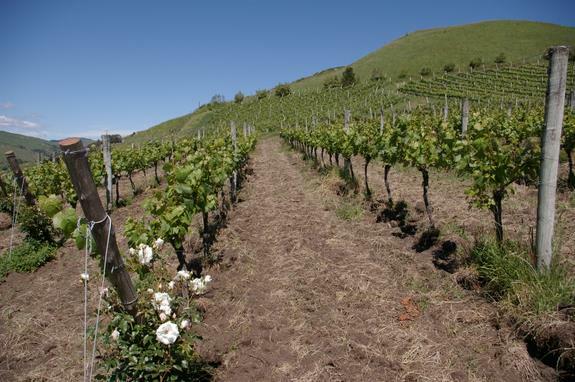 His wife Annie’s father had developed vineyards on his Opou estate in Gisborne, and so when James and Annie decided they wanted to establish their own winery, this was the obvious place to start. It’s fascinating that they’ve managed to make such interesting wines from a region that no one thinks much of. ‘Gisborne, with its clay soils, is acknowledged as making wines with full, fat fruit’, says James, ‘but I’m looking for minerality’. He’s surprised that there’s so little interest in Gisborne on the part of other New Zealand winemakers. ‘I’m confused about why people don’t want to lean over the fence and have a look’, he says. But there’s lots of interest from outside New Zealand, with people from all over the world coming to Millton to see what is going on. 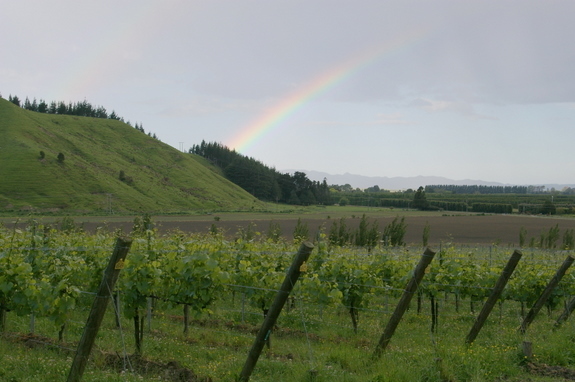 The estate now consists of four different vineyards in the Gisborne region, which James describes as ‘consistently inconsistent’. ‘We get vintage variation’, he adds, ‘and I think that’s good thing’. Opou, a 7.7 hectare vineyard, was planted in 1969, and then replanted in 1983. Young vines are being interplanted with old, and the idea is that if a row of new vines is planted between the old then the spacing will be better – originally it was 3 m × 1.8 m (2500 vines hectare), and the goal is to get it to 1.5 × 1 m (6000 vines/hectare). 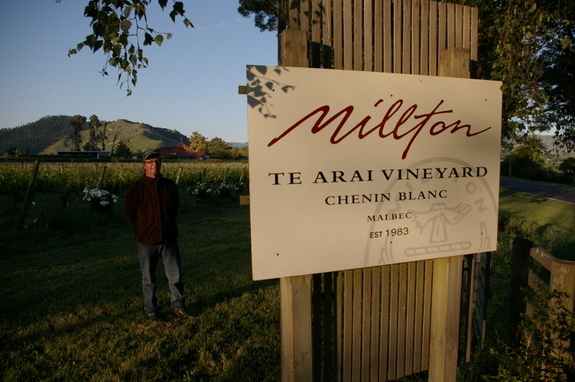 Te Arai vineyard is near this: it’s 2.8 hectares, and within it are two ‘clos’, named Samuel (Viognier) and Monique (Chenin) after James and Annies’ kids. Riverpoint is a 6.8 hectare vineyard growing Chardonnay and Viognier, while the jewel in the crown for Millton is the spectacular Naboth’s Vineyard, a steep hillside vineyard first producing in 1993. This site has been developed to include five different parcels, which together make up the Clos de Ste. Anne estate. Altogether there are now 30 acres here (approximatel 15 hectares), which takes the total Millton Vineyard holdings to about 30 hectares. What about biodynamics? To someone with a scientific mind, this increasingly popular form of winegrowing looks a bit strange. 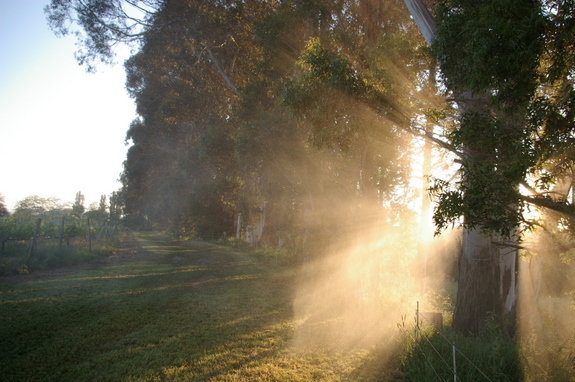 There are the usual organic principles: no herbicides, no pesticides (although copper and sulphur are allowed as ‘natural’ fungicides) and no inorganic fertilizers, but in addition a range of special preparations are used, and then either sprayed on the vines or added to the compost heaps that are an important aspect of this way of farming. In some cases these preparations are used at homeopathic dilutions; in all cases they are ‘dynamized’ by stirring in a particular way, and James has his own device for doing this. 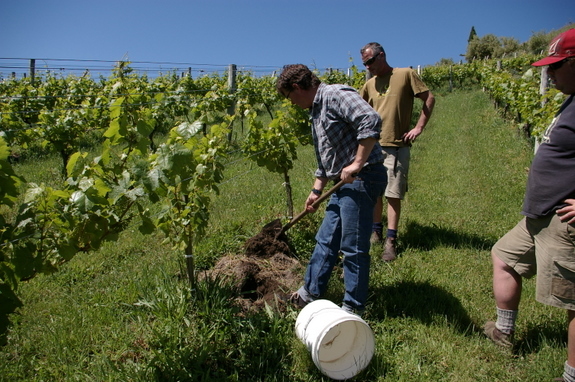 These preparations are applied according to the timings set out in the biodynamic calendar. The same calendar dictates when certain jobs in the vineyard and winery are carried out. Of course, there’s a bit more to biodynamic than a few sprays and organics: it’s a philosophical system that growers tend to embrace, and which then guides all their practice. I suppose the fundamental principle is for farmers to work in a way that is sensitive to the forces of life, and that encourages a healthy, living soil. 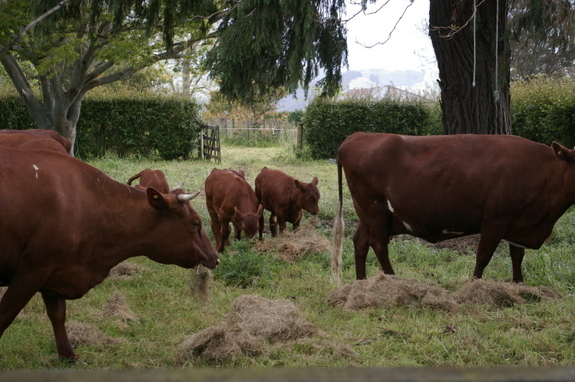 On my visit, I got a glimpse of biodynamics in action. First, there were the cows. 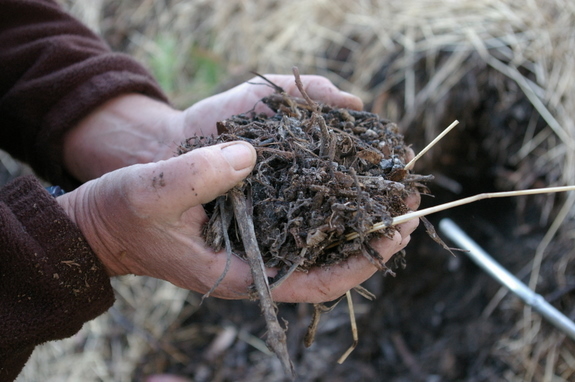 Until a few years ago James used to collect manure from a biodynamic farm. But then he decided to buy his own cows, and bought six six-week old calves. He’s now had three lots of calves with these cows, and they make his manure. James enjoys having the herd. ‘They rationalize my feelings’, he says. ‘They know when I’m cross and when I’m happy. Since they’ve been here the whole vineyard has changed. It seems to have a spring warmth to it, and the distraction they provide is quite positive’. The manure the cows produce is used for making compost, as well as being used in some of the preparations. The second glimpse was mixing and spraying one of the preparations, BD501. 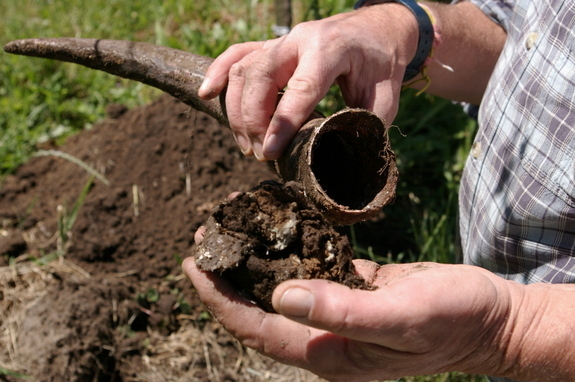 This is a silica (ground quartz) preparation that is buried in a cow’s horn, later dug up and then after mixing with water is sprayed on the vines. To do this, we had to get up at 6 am after a reasonably late night, but it was worth the effort. 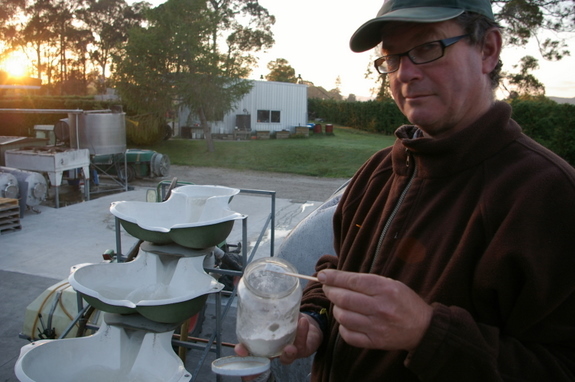 On a beautiful morning, with the sun poking through the trees, I watched James add a small amount of the white powder preparation to a barrel of water (above). The liquid was pumped through a Heath-Robinson-esque device that stirred the mixture one way and then another as it flowed through, thus ‘dynamizing’ BD501, making it ready for spraying on the foiliage of the vines (see video below). The third was the process of digging up cow’s horns, which we did later that morning. High up in Naboth’s vineyard, a few vines had been marked. James and his team dug, until they hit the cache of horns that had been buried here a few months earlier. Inside each of these horns was the preparation BD500. This is cow manure from lactating cows which is then placed in the horns for a subsoil sojourn. The resulting prep is a smooth clay-like paste that is then diluted and sprayed onto the vineyard soil, to encourage microbial growth.